The LIFX Z 3.3' LED Extension is the perfect companion for your LIFX Z Starter Kit. The LIFX Z 3.3' Extension provides 3.3 ft of extra LED length, allowing you to add smart LEDstrips to even larger living spaces and immerse any room with every imaginable color. The LIFX Z 3.3' LED Strip Extension is a great way to extend your existing LIFX Z Starter Kit and light up even larger areas. It has all the great features you come to expect from LIFX, with over 16 million colors, up to 8 addressable zones and connectivity to most major smart home products. You can create the perfect lighting for any mood or situation and setup is a breeze so it's easy to get connected right away. Find your perfect color and brightness combination: The LIFX Z LED Strip Extension has a color range of over 16 million and software dimming from 1% up to 100%. Color zones and themes The LIFX Z LED Strip Extension allows you to access individual and pre-programmed color zones. There are 8 addressable zones per strip, allowing you to add your choices of color combinations. Energy Saving: Energy consumption of the LED Strip Extension is only a tenth of normal light bulbs. Enjoy reduced energy consumption along with a 22 year LED lifespan. Compatibility The LIFX Z LED Strip Extension is compatible with all major smart home systems. Control your LEDs with voice commands via Apple HomeKit, Alexa or Google Home. With the LIFX Z LED Strip Extension, you can extend your LIFX Z Starter Kit by 3.3 feet up to a maximum of 33 feet. Decorate areas of your home with color to create the perfect light for you at any moment. The intuitive LIFX app allows you to fine tune your lighting experience, allowing you to control your entire strip or select colors for zones - the choice is yours. The LIFX Z LED Strip Extension is also compatible with most smart home systems such as Apple HomeKit, IFTTT, SmartThings, Nest, Alexa, Google Home or Microsoft Cortana. Installation of the LIFX Z LED Strip Extension couldn't be easier. Using a simple click mechanism, attach the LIFX LED strip to your LIFX Z Starter Kit, peel off the protective film from the tape and stick the LED strip onto the surface of your choice. Dive into over 16 million colors and dimming options and set the mood anywhere - behind your desk, under the TV or along the edge of your bed. Individual zones of your LED Extension strip have the ability to glow in different colors, giving you full control. You can also access pre-programmed color themes such as Dream or Halloween. The LIFX Z 3.3' Strip Extension is the perfect companion for the LIFX Z Starter Kit to kick start your connected home and transform your space with vibrant colors. Installation is a breeze thanks to the click mechanism and included self-adhesive tape. Solid fittings and attractive packaging. Intuitive setup, adjustable brightness and easy to control. iOS, Android and Windows 10 supported. Over 16 million colors, continuous dimming, light scenes with themes and more. Rated 22 Year LED life. Consistent and smooth color transitions and reproduction. Can be placed discreetly on most surfaces. 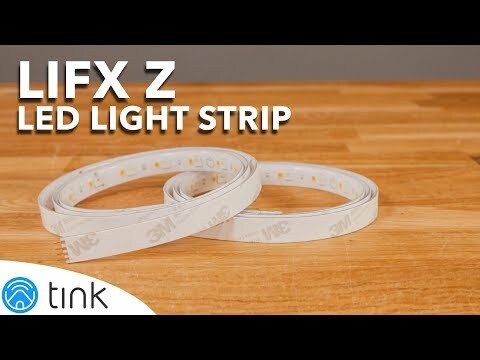 Can the LIFX Z 3.3' LED Strip Extension by shortened? Yes, on every sixth LIFX LED, you can shorten the LED strip extension at the marking. No, you don't need to be connected to the internet to turn your LIFX lights on or off - They will work like a normal light if you turn them on or off at the switch. But to accessthe colors and othe features you will need to have an active wireless connection. Can you use the LIFX LED Strip Extension outdoors? The LIFX LED Strip Extension is not suitable for outdoor use or exposure to wet conditions. This also means it is not suitable for use in bathrooms or other levels with high moisture or humidity levels.